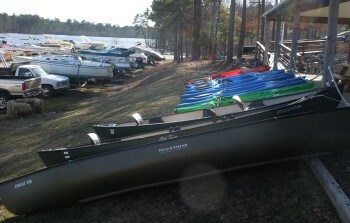 It’s never too early to make plans for “summer”izing your boat during the off season. Rollingview Marina is ready to provide every service you need to get your boat ready for the 2018 season! Of course, self-sufficient boaters are welcome to splash their boats themselves. In these cases, your team at Rollingview Marina is happy to assist, however driving the boat, charging batteries, testing systems, etc. are responsibility of the boat owner. During splashing of their boat, the tenant MUST drive the boat. PLEASE NOTE: Due to several days of below freezing temperatures this winter, batteries probably did not do well if they were left in the boat. 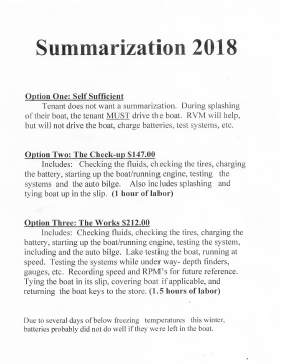 Click here for our Summerization document, print your copy, jot down your contact information (name, phone number & email), indicate the level of service you prefer, include signature & datem and return it to Rollingview. We’ll take it from there! In order for Rollingview to perform your preferred services, please circle the type of option that best fits you. Rollingview will not be responsible for doing any work until the form is filled out and signed. All accounts must be in good standing before work is started. We look forward to serving you and getting your boat in “ship shape” for the summer!